Editor’s note: The Farnborough Air Show begins next week. Mitsubishi is expected to have a flying display of the MRJ90 at an international air show for the first time. This is the last of three stories from Mitsubishi’s MRJ program update in Moses Lake (WA) last month. July 10, 2018, © Leeham News: An engine flameout in August 2017 that left the Mitsubishi Regional Jet (MRJ) test fleet grounded for several weeks was caused by a manufacturing quality issue on a component in the Pratt & Whitney geared turbofan’s accessory gearbox, according to a Mitsubishi executive. MRJ delays over, execs insist (now open to all readers). Laser focus for MRJ program (now open to all readers). MRJ program chief Alex Bellamy said the manufacturing quality problem caused a machined component to suffer a durability issue, leading to flameout. The program’s no. 2 test aircraft was about 105 miles west of Portland (OR) over the Pacific Ocean when the flameout occurred Aug. 21, a Mitsubishi spokesman told Airways magazine at the time. The MRJ90 landed without incident at Portland International Airport. Its PW1200G engine was taken off and sent to Pratt & Whitney. On Aug. 24, the airplane returned to Moses Lake (WA), home to the MRJ flight test program. The Pratt & Whitney PW1200G engines are a key selling point for the MRJ series, Mitsubishi’s first foray into the airplane-making business. The GTF engines are meant to be a leap forward in engine technology. It’s not widely known, but it was Mitsubishi that launched the GTF program with Pratt & Whitney, not Bombardier and the C Series. So far, the GTF has experienced significant—and well publicized—teething problems on most of their five platforms: Airbus A320neo, Bombardier CSeries, Embraer E-Jets E2, Irkut MS21 and Mitsubishi MRJ. However, none of the problems have been fundamental, and Pratt has resolved them or is in the process of doing so. Bellamy’s not concerned about the GTF’s ability to perform as promised. 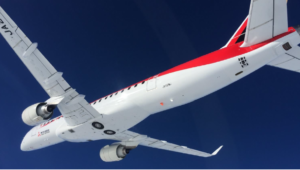 Fixes from other versions of Pratt’s GTF have been rolled into the MRJ’s PW1200G, which was certified in 2017. The MRJ engines have tallied some of the highest service hours in the GTF program, with more than 10,000 hours, said Bryan Rivard, head of Pratt & Whitney’s PW1200G program. Pratt & Whitney claims the engines save operators’ $1m/yr per aircraft. That number is an average of savings for all aircraft, Rivard said. The engine manufacturer and Mitsubishi Heavy Industries set up an engine assembly plant in Nagoya, where the MRJ final assembly plant is located. The first build of a PW1200G has started, Rivard said. In the meantime, Pratt has also assembled MRJ engines in Mirabel, Canada, and Middletown, CT.
One of the MRJ90 test planes showed off over Moses Lake for US and Japanese news media. As the sleek jet banked away from the reporters, the noise from its engines drastically dropped off. Wish Mitsubishi a lot of goodluck, patience, persistence and focus on this project. With their precision and tidiness, hope they will become a major pylon of Global aviation. They will have however to also prepare seriously, that in support of an outstanding product, to also build an outstanding Product support organization that will be capable to truly delight Customers. But 75% or 40% of what? If there are two different baselines – e.g. measured against a CFM56-5a on the one hand or a GE34 on the other – the discrepancy disappears. Fully agree and wish Mitsubishi the best for this aircraft. Realistically I don’t think the MRJ is headed for anything but commercial failure. 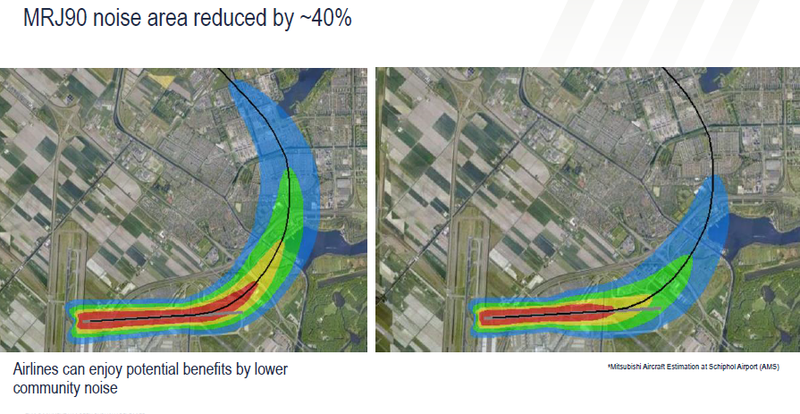 The noise reduction whatever it is is merely a benefit, its not a key seller, all aircraft have to meet the minimum. If its better? Kind of so what. 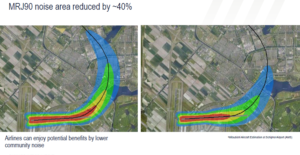 How many airports would that be a key point for? Would they get an GTF exemption when no other airlines can operate ? Any small airport and town is going to be delighted to have any service. People in large cities are going to complain regardless. ANC is undergoing N/S runway work and traffic is going over the city and people are complaining. Mitsubishi’s first foray into the airplane making business, really? How about the MU2 or the infamous Zero? They’ve been making planes since 1928. Very true. They had been in this business since 1920s and produced some of the finest aircraft during WW 2.